Sunny apartment with beautiful views, right on the edge of the forest! 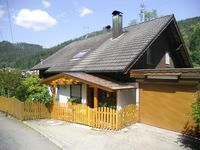 Property 7: Sunny apartment with beautiful views, right on the edge of the forest! The silence and peace that one can experience while staying here is fantastic. Agenbach is a lovely little town with very friendly people, plenty of places to walk in the woods and fields, and get away from it all. There are no businesses of note in the town but plenty of small towns in the area have anything you may need within a few minutes drive. The house is immaculate and the kitchen is well equipped. There is no microwave which is fine, but worth noting. There are spices, oil, and vinegar, good coffee and tea preparations and an excellent stove. Good pots and pans and everything you need to cook lovely meals. 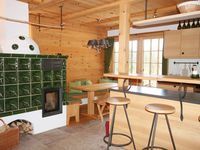 The wood stove is incredible and warms the house beautifully on the colder days, and on sunny autumn days, no heating is required as the floor to ceiling windows pour golden sunlight and warmth into the house. Ventilation is easy and complete, and airflow can be ensured as plenty of windows are available to open. There are a great number of games and books in German to read, and all seating areas and couches are very comfortable. The Showers are fantastic, and the Sauna is relaxation pure. There is a small &quot;gym&quot; area in the Sauna area which allows a place to do some activities like body weight exercises or Yoga. The WiFi is stable and functional, however, it is not blazing fast, so if you are looking to perform work while on vacation which requires heavy uploads or downloads, please think about enjoying your surroundings first and foremost and close your computer. I cannot wait to have the opportunity to return to this property. It is magical and I feel completely refreshed after my visit there. Monika and Herbert were great hosts! Although we did not speak each other's language, they were all smiles and google translate helped bridge the gap. The space was very clean, in a great location, and had the most beautiful sights of the mountains. I hope to visit Bad Wildbad again!